I think this was the last photo of us together. 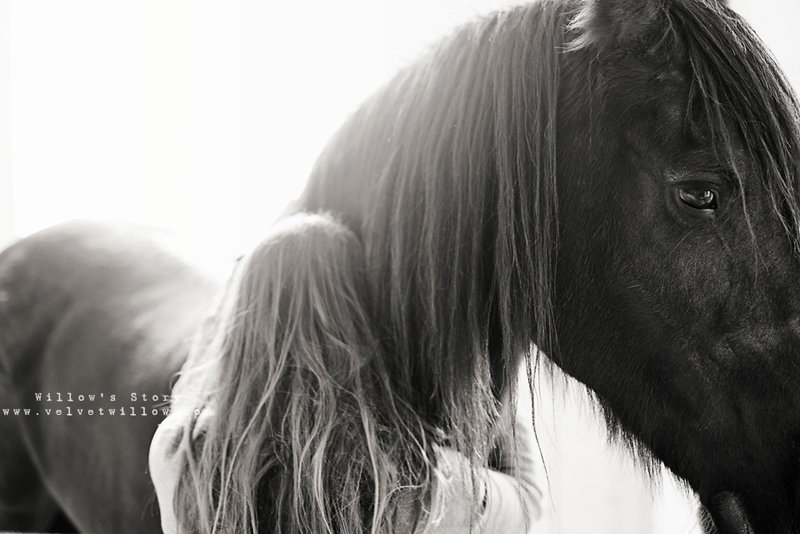 I was a mess... crying so hard in the comfort of her mane. I am trying so hard to learn from my sweet Willow... though she was a horse, she rose above all of the awful things in her life and held her head so high. She was such a good example for me, and I've been trying harder to live like she did. Willow had the most soulful eyes - like she just got what life was about. I see so much good coming from Willow with your new horses, especially Misty. You and her had/have an amazing bond. I am so grateful Willow found you .. I am so grateful she got to know what true love really was. You gave her such a beautiful life and so much love. And she has come back to you in so many ways ! I don't think she will every really leave you ! Your beautiful love story has moved me instantly to tears; my huskies are terminally ill and so I feel your pain. She will never leave you, your love will last eternally. i love this story so much ... i followed during willow's sickness and it truly broke my heart ... your love for her is such a beautiful example of pure love ... animals do that for us if we let them. This picture makes me tear up.... I love it so. I think about this story everyday. I hope one day you are able to write a book about this. It's such a wonderful story. I discovered Florabella around the time you moved to Tennessee. I'm always so drawn to your horse portraits. I just discovered your link to this blog. I sat down to read a post and couldn't get up until I finished it all. I have so many thoughts, but they all amount to this..."Thank you." Thank you for your Lucy moments that lead you to do something beautiful. And thank God these horses have found their forever home with you and your loving family. The emotion evoked in this image is unreal. So incredibly beautiful. And the contrast of you next to Willow, like she was protecting you.. guarding you.. I have followed your blogs on and off since Sophie. I am a friend of your mother and Susan. I think we even met once in FL. It's been a while since I've read any of your blogs but that cute picture of Sasha sticking out her tongue on FB eventually led me to this blog which I was unaware of. I stayed up until 3 am reading almost all of the blog. I cried, giggled, smiled and was touched very deeply by your experience. Willow is still touching people. Amazing! Now I must experience the power of horses. I don't how that will play out but Willow planted a seed. The next day, after staying up until 3am, a friend called who happens to own a few horses. I barely let her get a word out before I said "I must come see your horses!" Hey its Taylor Steele, I cried the whole way through this, I have a weak and heavy heart for abused animals and children I cant wait for the day I will b able to rescue! What exactly happened to Willow?